The IBBY-Asahi Reading Promotion Award was established in 1986 during the IBBY Congress in Tokyo. The Asahi Shimbun newspaper company sponsors the award. It is given biennially to one group or institution whose outstanding activities are judged to be making a lasting contribution to reading promotion programmes for children and young people. The nominations are submitted by the national sections of IBBY and may include projects from any part of the world. The jury consists of members of the IBBY Executive Committee. 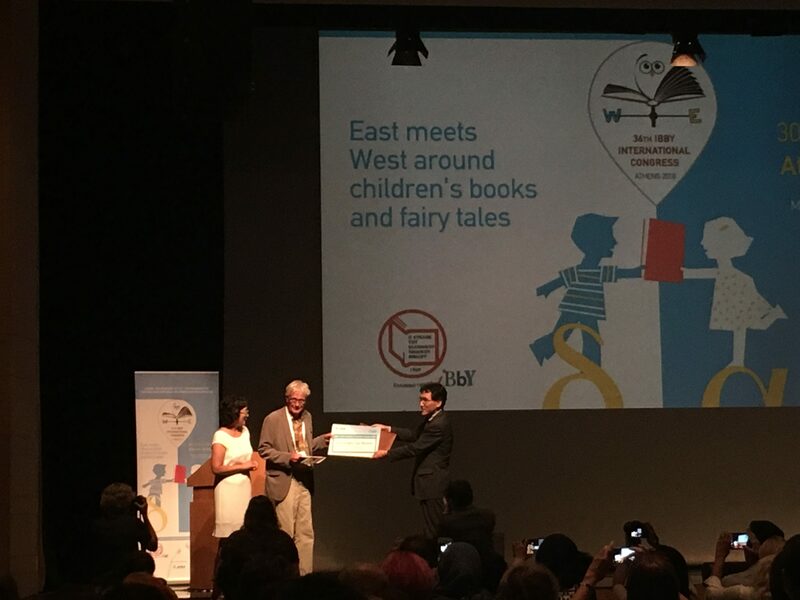 A diploma and a prize of US $10,000 is presented to the winners at the biennial IBBY Congress. The 2018 winning project is Les Doigts Qui Rêvent (Reading fingers). Les Doigts Qui Rêvent (LDQR) was created in 1993 as a response to the observation: a total lack of access to Tactile illustrated Books (TiBs) for visually impaired children in France, Europe and the world. The idea was to create and produce TiBs that would be accessible to blind children with the same level of quality as books published for sighted children. Books that are crucial to help blind children in their familial and social inclusion. Books that can be found in the same cultural places where the sighted find their books, such as in school and public libraries. LDQR began as an initiative of a group of parents and a teacher in Talant, France. The teacher of the group managed to produce 100 copies of one TiB title by using improvisation. It was successful and was accepted and used by parents, teachers, professionals and librarians. However, this success proved that there was an urgent need to create a special production workshop. Because of the complex nature of these books, in terms of design and the large amount of handwork needed, it was and still is impossible for small private publishers to produce them commercially for a small market. To help solve this problem, the initial group created a model of the production methods based on a social and solidarity economy. One of the aims of LDQR is to sensitize parents, teachers, educators, illustrators and other professionals to the importance of TiBs and to encourage the creation of beautiful tactile books. Another important objective is to encourage the integration of blind children into mainstream schools through the use of workshops. Through research initiated by LDQR and in partnership with universities, more knowledge has been gained into the perception of visual-impairment and the tangible and intangible advantages of these books. Establishing international partnerships, publishing more TiBs and reducing publication costs have helped LDQR reach one of its original goals of making TiBs more affordable even in the poorest of communities. Over the last 24 years, the project has been consistent, sustainable and has expanded so much that its ideas and know-how have spread out across France, Europe and the world through the establishment of worldwide partnerships. LDQR has been instrumental in increasing the quality and quantity of TiBs all over the world and so improving access to books and reading for all children. The IBBY-Asahi Reading Promotion Award was founded in 1986 and until this year has biennially presented the award to two projects that are run by groups or institutions whose outstanding activities are judged to be making a lasting contribution to reading promotion programmes for children and young people. As of 2018, due to economic necessity, one winner will be selected every two years. The winner is selected from among projects nominated by IBBY national sections from all over the world. You can view past winners here.